I remember seeing Rivers and Tides in the theaters, when it came out in 2001, and really enjoying it then, but I hadn't seen it since. Fate or circumstance brought it to mind last week, and Deb and I found it was up on Netflix Instant Watcher, so we watched it straightaway. I gotta tell ya (so I am), speaking as someone preparing to wander off into the woods, to build some sort of ritual out of communing soulfully with my natural surroundings, to ceremonially give witness to a change of nature within myself, as it is reflected or amplified in that environment--I can't imagine a cinematic experience more conducive to establishing such a frame of mind! 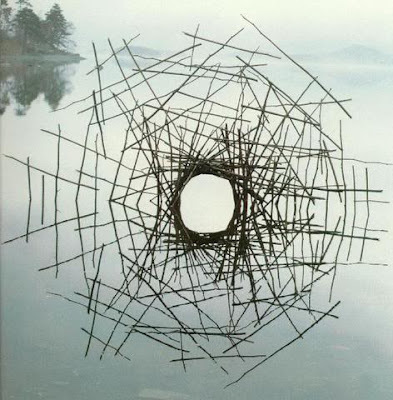 it's a documentary, subtitled "Working with Time", about the art of Andy Goldsworthy, who builds sculptures, usually in natural settings, of local, natural materials, which often speak about the effects of time and change as manifested in the natural world. Some of his art is as ephemeral as a windblown cloud of dust, some as indelible as a fracture across a boulder, and it occupies a variety of temporalities in between; but, as he quotes of Brancusi in the movie, "Why talk about sculpture when I can photograph it?" Or rather, when you can watch the film of it. It felt like nearly everything coming out of the guy's mouth was profoundly resonant with everything this vision quest aims to help me engender in myself, ripe with non-duality, delivered from a place of intimate familiarity with inter-connectedness. I've spent a couple of recent morning meditations watching it and transcribing the script. In one of my favorite passages, we watch an egg-shaped cairn of stones he's built, be swallowed by an incoming tide, as he talks about his work having been "given to the sea as a gift, and the sea has taken the work and made more of it then I could have ever hoped for. And I think that, if I can see in that, ways of understanding those things that happen to us in life, that changes our lives, that causes upheavals and shock...." He can't finish the thought--except through just about everything else he says and does. So, so glad to have stumbled across this again. Then, this evening at work, a mate was mentioning that a certain dread-locked violin playing busker he'd become used to seeing in Civic Center BART, and who'd been missing for a few weeks, had finally returned. That got me thinking about another dread-locked violin playing busker I used to see at Montgomery St. BART, in the mid 90s, when I used to work downtown. I knew he'd left for New York some time 'round then, and it was a real jaw-dropper when I saw that someone had made a documentary about him--and that the documentary won an Oscar in 2002! I hadn't seen it, so when it came up, I searched YouTube, and the full length (42 min) movie, Thoth, is posted there. So, Deb and I just watched that tonight. It may not be as directly pertinent to vision questing, as how the Goldsworthy flick felt, to me anyway, but it does paint a fascinating picture of a man who passed through a lot of personal pain, into a place of seemingly unrestrained expression of his gifts, launching a relentless exploration of his vision along the way. I don't know if that's been released on DVD or not. Rivers and Tides has--or, again, it's streaming on Instant Watcher--but I also found it, segmented into 10 minute chunks, on the YouTubes. I made a playlist, there, of the two together, for your viewing convenience.